Limonium has many different names that all reference the same plant. It is often called Sea Lavender though it is not related to lavender. It may also be called Marsh Rosemary but again there is no relation. This delicate looking bloom has many uses for floral arrangements. It is also a very popular plant for home gardens and landscapes. It can be grown in many conditions and provides many color options. Over 120 species are in this genus, which include many variations. Grown from a rhizome, these are perennial plants that flower yearly. The simple flower design appears in clusters that make it delicate. L. californicum is a species native to the western part of the US. It is often called California Sea Lavender and grows in the wild. It is often found in salty areas, such as beaches or other wetlands. The leaves are often leathery and the plant has a tough appearance. Large clusters of blooms are visible on the almost wood like stems. Petals are often lavender, with some appearing white or off white. Known as Rock Lavender, L. binervosum, has many subspecies in Europe. The petals are a light purple, with some appearing a soft blue. It is widely found in salt marshes or in alkaline and loamy soils. Full light is often best to get fast growth and vibrant flowers. Some species may adapt to partial sun or partial shade locations. Some of the resistant species may also tolerate nearly full shade. In windy areas, new plants may require support until established. Stakes or cages can be added to allow plants time to stabilize. A broad mesh screen may also be used to help block some of the wind. Light soil is ideal, though many other conditions can be tolerated. Limonium near water, such as the beach, can grow in salt wetlands. Slightly alkaline soil may also be used, as well as dry flat earth. The plant is commonly grown in flower gardens or along foundations. It is typically planted in the back as it can grow slightly tall. It may be planted with other fall blooms or in a mixed season bed. It can also be grown in a container, such as a large patio pot. This allows for more options when seeking ornamental plant species. It can also be used as a landscape cover if there is a lot of land. The misty appearance of the full blooms creates a dreamy feeling. For this reason it is often associated with remembering someone. It is a popular addition to any arrangement for love or friendship. Common cultivations are widely used by florists to make arrangements. It can be easily used as a filler plant to expand the bouquet size. It can be readily grown, making it inexpensive to use in bouquets. The flowers can be dried and will retain shape and color very well. As it is delicate, care should be taken to avoid crushing blooms. Some may prefer to use lighter colors while others use darker ones. Caspia is often grown in gardens and cut for fresh bouquets at home. Many choose to grow it in containers or along a rocky path at home. 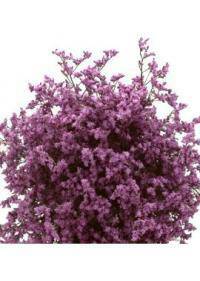 Limonium is widely used by florists for both dried and live bouquets. For cut stems and live bouquets, we commonly service Tucson, AZ, Daly City, CA, Mission Viejo, CA, Orlando, FL, and St. Louis, MO. They can be used to compliment other flowers with its non-vibrant coloration.